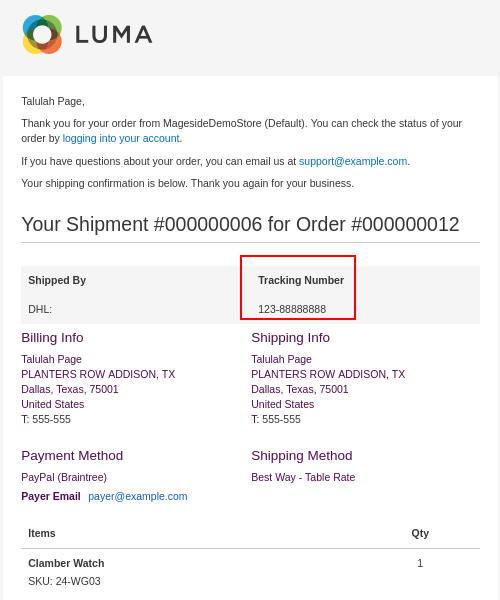 Magento 2 Blog - Mageside - How to add tracking numbers in Magento 2? The tracking number of any shipment is as important as the shipment itself. If you are an online store owner, you would know this. 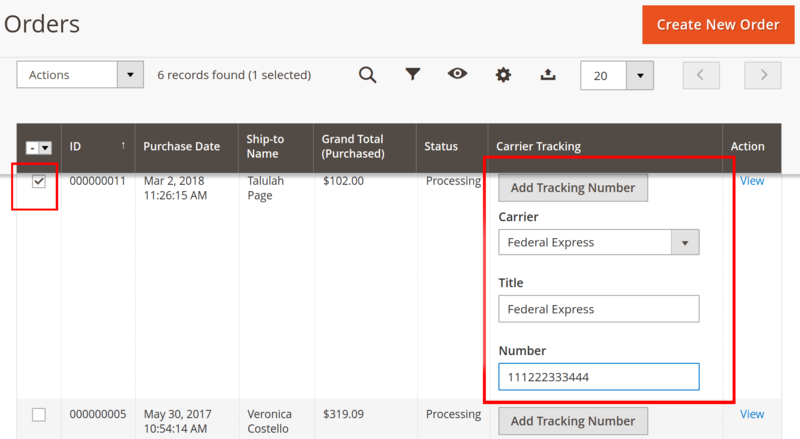 Important to realize, that advantages of a tracking number can never be estimated. They aid in the correction of shipment errors. If the wrong product is sent to the wrong customer, the tracking number is what helps to solve the problem. 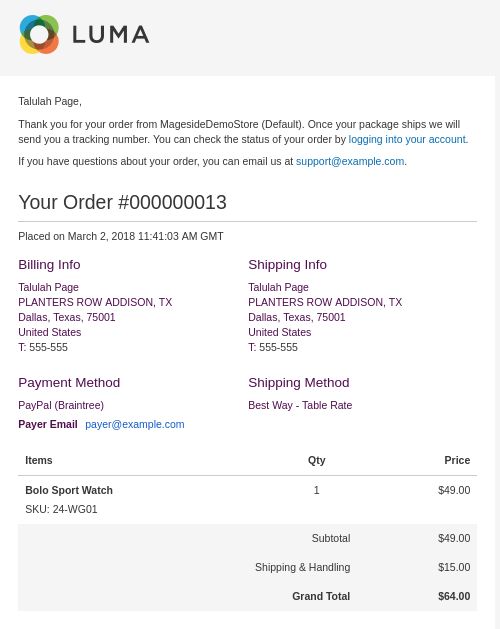 It makes it easy to identify the location the product and subsequently redirect the order. Without the tracking numbers, such misplaced orders of products will waste. The funny thing to note is that the more products you ship out to your customers, the more tracking numbers you have to include per product. This increases the stress involved in dealing with customer orders. Applying for the tracking number individually is stressful, time-consuming and prone to mistakes and errors. All these disadvantages would affect the shipment in the long run. You should, however, note that a bad shipment results in an unhappy or irritated customer. That fact is very bad for the reputation of the store. The tracking number normally adds to packages before shipping. They help to track the location of the deliveries and tracking shipment for both the store and the buyer. 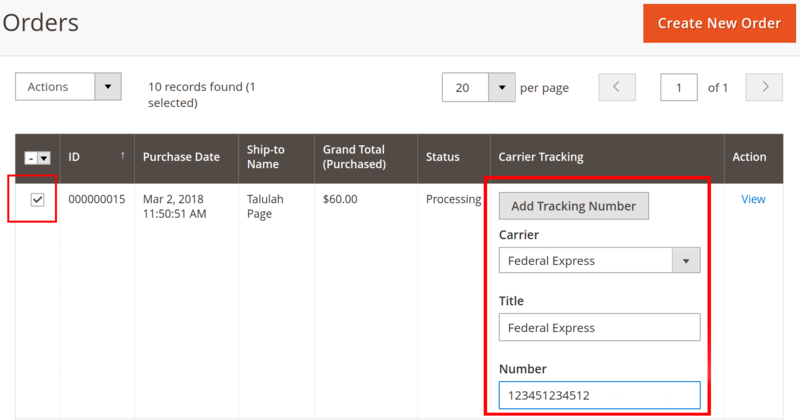 The format of the tracking number is of different types depending on the country/state the package has been shipped to, the country/state the package is delivered to and the shipping company involved in the delivery. It can be quite complicated to handle a lot of orders from your store. A lot of orders are good for business but they can put pressure on the resources available to a store owner. This pressure can be devastating for the store and lead to bad shipments. 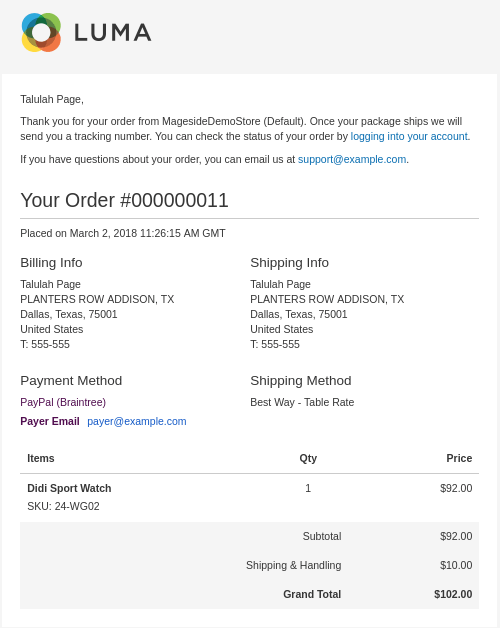 It is easy to make a mess while rightly putting all those tracking order places by sliding from page to page on your Magento 2 store. Also, an occupation such as this takes a lot of unnecessary time from your workers. Nevertheless, our team presents a page to page solution that ensures that your orders will avoid messing up. Now you do not lose your customers! 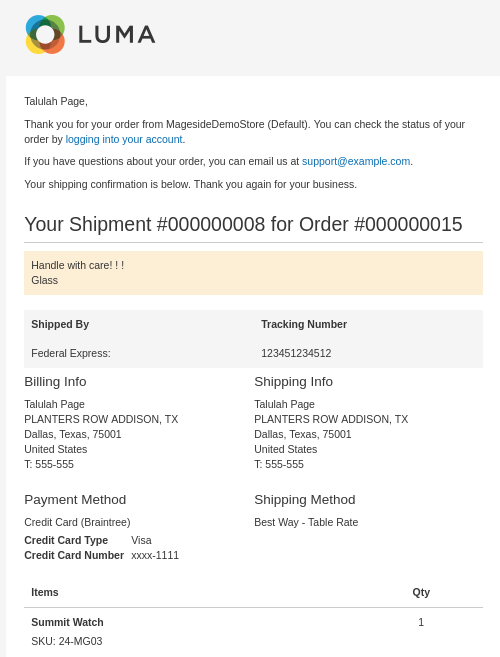 Our Mageside team is committed to the creation of convenient Magento extensions. They will aid you in the order management system concerning all aspects of your sales process. Due to this reason, we advise that you try out our Mass Order Processing module for your online store. With our module, you will be able to create and add combinations of actions from the order grid. 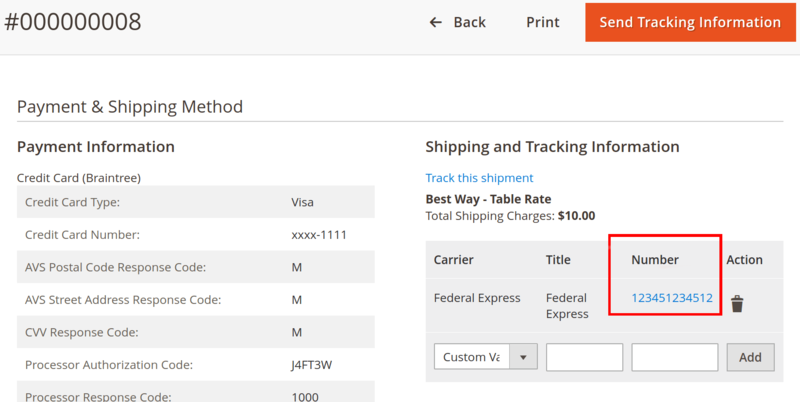 This includes adding track number, invoices, and shipments. 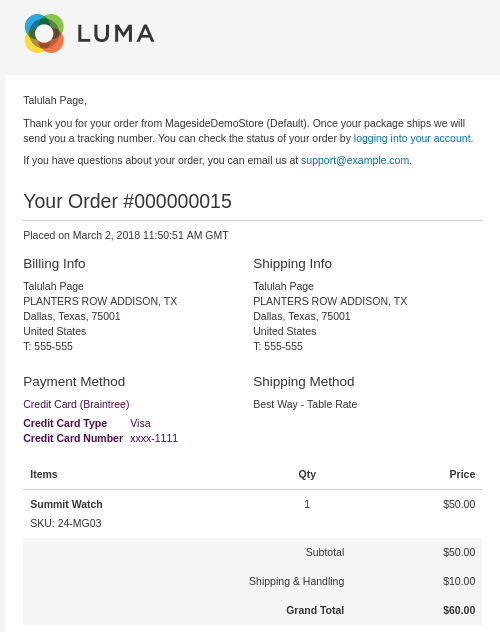 Actually, running the process Magento shipping is rather well-formed. But with the use of our extension, you can process all these actions to a lot of orders at once. This will help save time, reduce stress and prevent wastage. This means it will eliminate all the problems associated with tracking numbers and wrong additions. By making use of this module, you get to service customers better, deliver more goods, and consequently boost your sales. It is also a great method which uses to avoid wastage and loss of resources. Moreover, you can use this module combines with other extensions. It helps to make sure you have quality product delivery and all the customers get the particular thing they order. It helps to eliminate stress, errors, mistakes, time wastage and product wastage. In brief, by affording your customers the opportunity to get their order track number very quickly, it will lead to increased convenience in the use of your store. Also, the module will allow your employees not to dissipate their focus in the completion of the sending forms. This will leave you with focused employees and lesser stress. 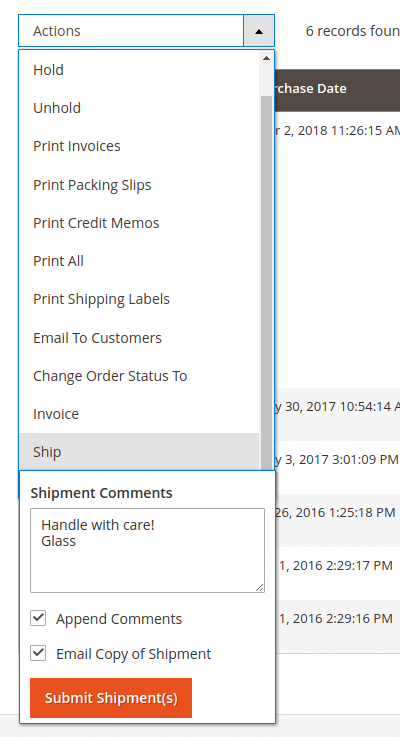 This will consequently reduce the number of incident errors that occur when assigning a tracking number. The lesser the number of incidents, the better for you and your store. The reason is the customers who have faced incidents are likely to get irritated and not come back. 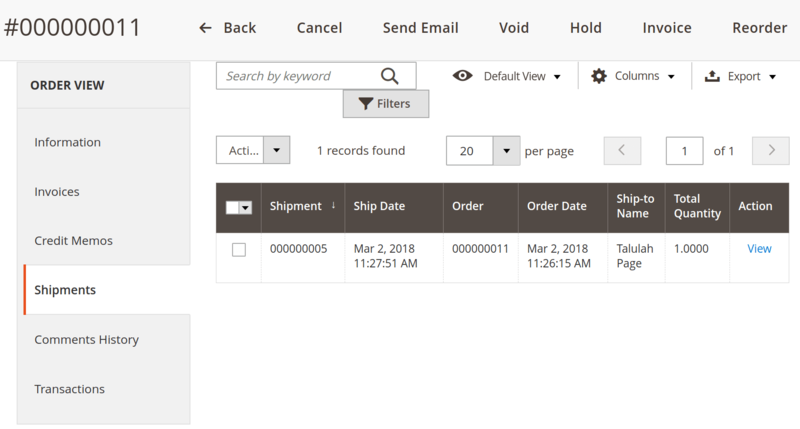 If it is your plan to keep those customers loyal, you are advised to make use our Mass Order Processing module and keep your online store at the top. 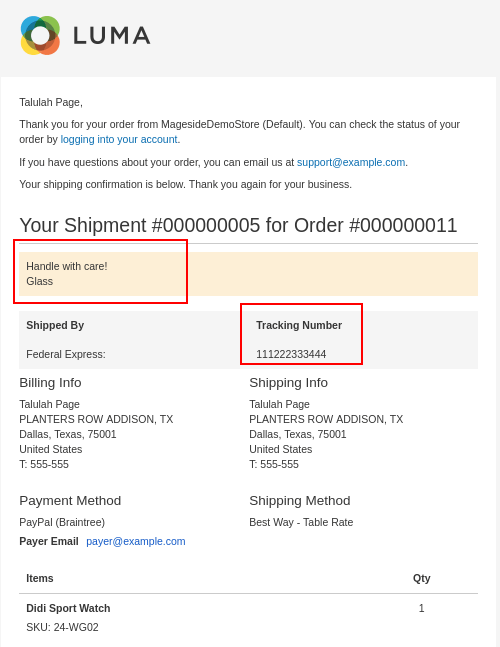 To add a tracking number you have several ways depending on buyers' payment method. 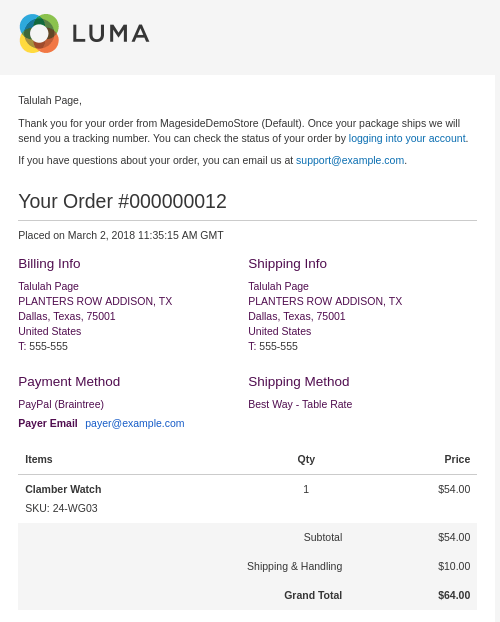 From our example, Talulah Page made an order and she receives the email with “Order confirmation” with her order number #000000013 on her email box. To generate a combination of tracking number and invoice you need to select a necessary orders in the order grid. Then, tick on the corresponding checkboxes of the necessary orders. Also, select in a dropdown list the Carrier and fill in Title and Number boxes. 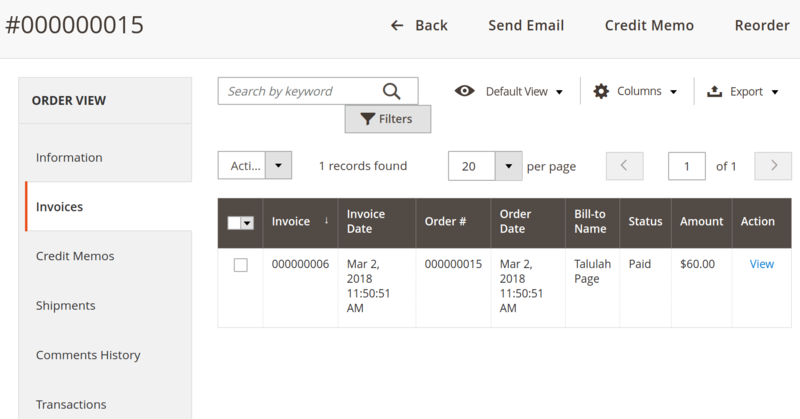 The next step for you is to select the Invoice in the Actions dropdown list. In this segment, it is possible to add Invoice Comments, choose additional functions such as Append Comments, Email Copy of Invoice and Create Shipment. In this case, we intend to create tracking number and invoice so we tick the first two checkboxes. You will also be able to choose in Capture field between Capture Online, Capture Offline and Not Capture. 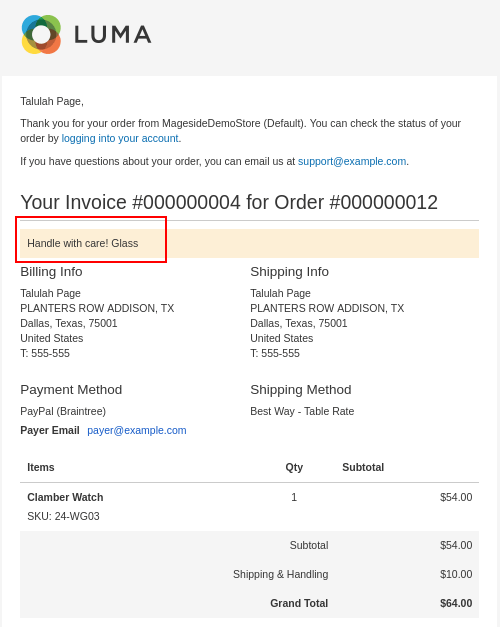 For you to be sure that your actions are correct, navigate to the necessary order page and check the Invoices section. 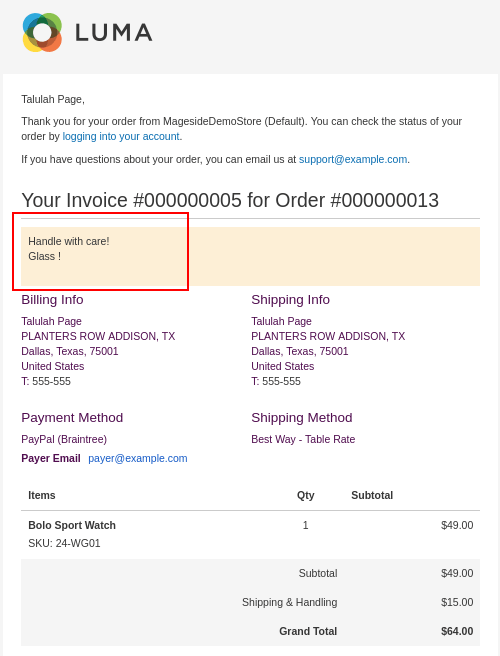 Moreover, Talulah Page received an email “Order” (with comment and invoice) right after your actions. 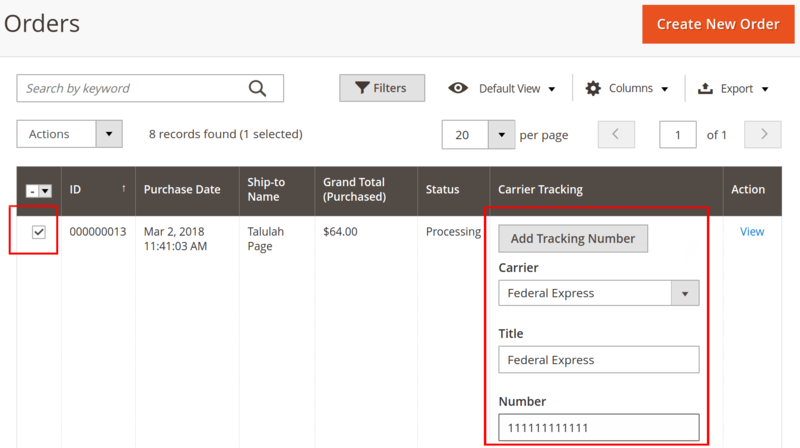 To generate a combination of tracking number and shipment you need to select a necessary orders in the order grid and tick on the corresponding checkboxes of the necessary orders. Also, select in a dropdown list the Carrier and fill in Title and Number boxes. The next step for you is to select the Ship in the Actions dropdown list. 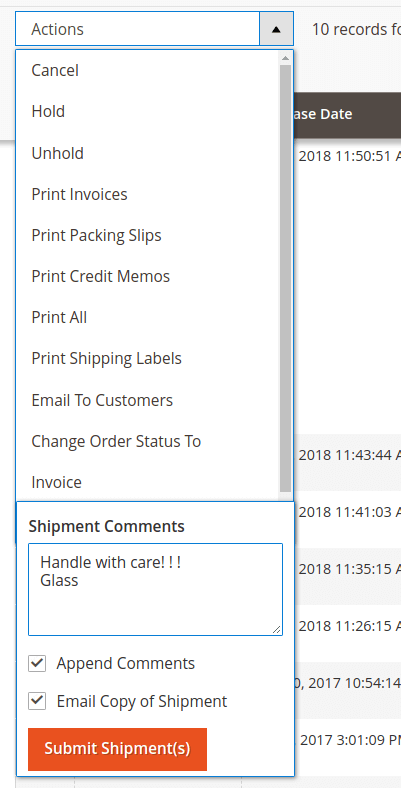 In this segment, it is possible to add Shipment Comments, choose additional functions such as Append Comments and Email Copy of Shipment. In this case, we intend to create tracking number and shipment so we tick all checkboxes. 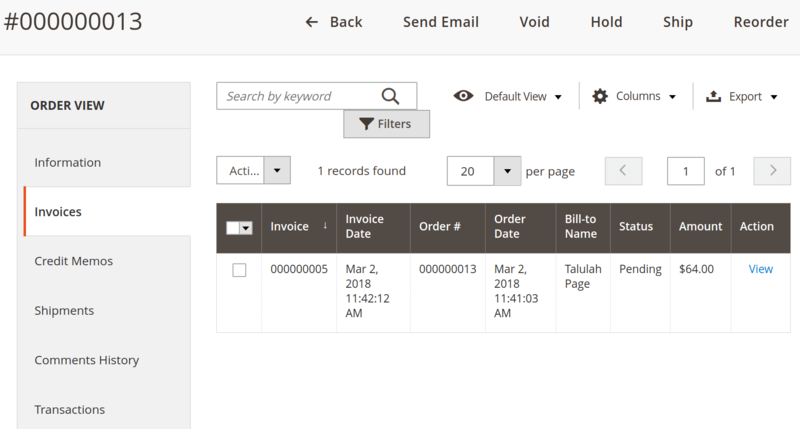 The next step for you is to select the Invoice in the Actions dropdown list. 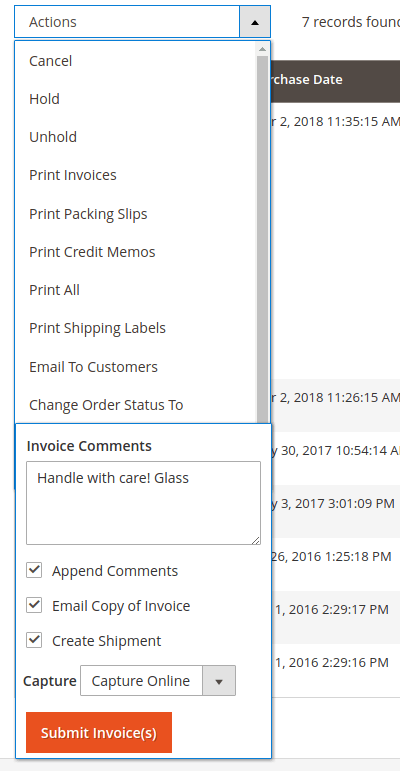 In this segment, it is possible to add Invoice Comments, choose additional functions such as Append Comments, Email Copy of Invoice and Create Shipment. In this case, we intend to create tracking number, invoice and shipment so we tick all checkboxes. You will also be able to choose in Capture field between Capture Online, Capture Offline and Not Capture. The next step for you is to select the Ship in the Actions dropdown list. 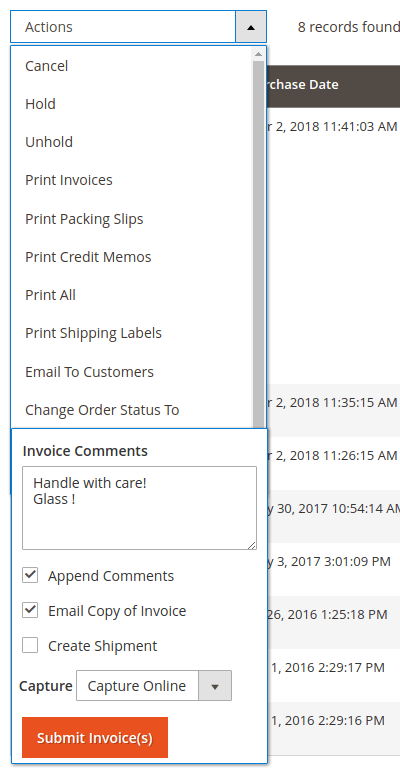 In this segment, it is possible to add Shipment Comments, choose additional functions such as Append Comments and Email Copy of Shipment. 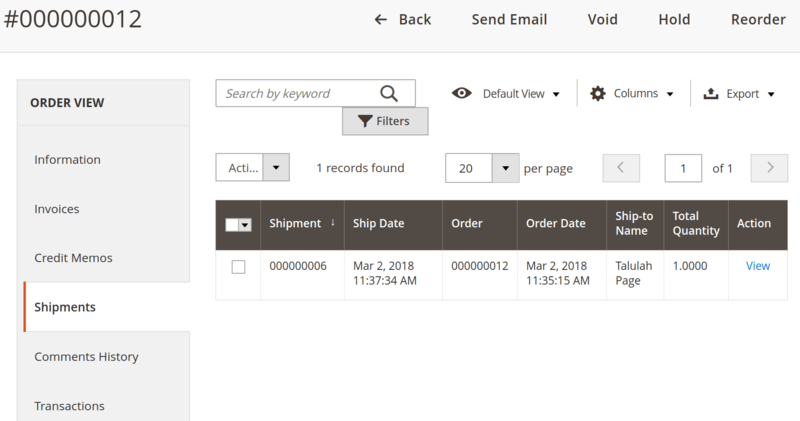 In this case, we intend to create tracking number and shipment so we tick all checkboxes..
As was already mentioned, that in “authorize and capture” method of payment the Invoice will be created automatically and you can check it in the Invoices section.